Tanya Wagner (1st overall) from CrossFit Apex describes her training. I have always been an intense person when it comes to training or playing sports, whether it was goalkeeper training for soccer or a backyard game of volleyball. I think that's why CrossFit really fits my personality and my style (with that intensity piece being such a crucial element). I can honestly say that intensity is really the only thing that I'm consistent with in my training. I really try to follow the recommended 3 on 1 off schedule but rarely, if ever, does that actually happen. Sometimes I'm 2 on 1 off, or 5 on 2 off. I try to get in as many days in a row that I can until I know my intensity suffers from fatigue. The majority of the time, I'd rather rest one day and hit a better WOD the next than have a crappy WOD just to get one more day in. That being said, I understand the importance of training under the influence of tired muscles, lack of sleep, hunger, temperature variations and all the rest, so I do hit WODs under all circumstances, and try not to let any of that be an excuse. I hit one of my best Grace times after a late night out with friends and only a few hours of sleep with a killer headache. I think varying training days, times, and physical conditions really works for me and really seemed to help me for the Games. I can be mental at times, and always used to be very methodical with soccer in high school and in college. My training had to be precise and my warm up was identical before every game or I'd mentally be out of it. When I think about it now, that approach used to hurt me to a degree. I like how CrossFit has helped me to not have any excuses and has made me more disciplined mentally. As for my actual workouts, I typically do the WODs that we program for Apex. I don't have an extensive warm up routine. Usually I workout after having trained a few classes, so I'm already somewhat warm. I'll maybe hit the rower for a few hundred meters or jog an 800 and then possibly do some pullups, pushups, and air squats. Whether I do that or not just depends on the day, but I'll always hit my weaknesses for a few minutes before the WOD. In the months before the Games and even now I always do handstand pushups and muscle up work. I'll also do whatever moves seem to be lacking either in programming or that I'm just not happy in my performance with. Our Apex WODs follow the same format as the main site, as we vary everything and range in all time domains. I'm a huge fan of a M/W/G WODs, but I definitely do all variations in my training. The biggest one I probably lack overall is the strict 1RM heavy days, but I may hit some heavy lifts as a warm up here and there. Although we don't program those single heavy lifting days as often as we could or should, our WODs often have some heavier lifts. I'll even go up in weight some days if I'm feeling it, and I think that has also really helped me along the way. The only other thing I can say about my training is that I train with some sick men! I am always chasing one of them or they're chasing me, whether it's in person or on the whiteboard. I usually train with Josh and he's been the greatest push for me. I really couldn't ask for a better training partner. He's usually just ahead of me so that I have to push to get him or I'm just ahead of him so I know I can't rest. We're really comparable with a lot of movements so it's always a competition. If we don't get to train with our other co-owners Mike and Keith, I at least have their times on the board to push against. That white board is an amazing thing! We all know each other's strengths and weaknesses, so the days we can actually hit a WOD together...look out. We have a blast and it's seriously like we're competing for the golden sledgehammer every time! Great insight Tanya! I'll definitely be checking out the Apex site more often as well! Keep up the fantastic work! Tanya is a true role model for CrossFit and brings with her incredible heart, skill, and kindness. Being new to CrossFit I had to do some digging for what M/W/G stood for so hope this enlightens or helps the recollection for other folks out there. Tanya, I'm sorry I never got a chance to meet you in California. All I can say is that Christy speaks the world of you. Thank you for sharing your training with everyone and congratulations on an incredible performance at the Games. I heard Tanya describe her training routine on the recent Crossfit Radio, and what really stuck with me was how she described bringing full intensity to every workout, as she further described above. That is aweseome, and it's inspired me to kick it up a notch, even when I feel weak. I can definitely relate to having limited time to do my WODs, and I know I'm not alone. It's amazing to see how much Tanya has accomplished by working out with main site volume, or perhaps even less, just by making each workout really count. Her workout routine is in stark contrast to the immense volume of Mikko's. It's awesome to see that this level of fitness can be achieved without a program that would be impossible for most to adhere to. Tanya's program reinforces the efficacy of the main site programming. Mikko's kind of suggests that if you want to win the games, main site is inadequate. At most levels of non-olympic sport, women who are dedicated to training harder than the norm will succeed. On the men's side, the fight to be the best is that much harder due to higher participation rates. The times Mikko lays down in 1k running repeats cannot be built by .com programming, neither can the ability to deadlift what he can at his bodyweight. On the other hand, most physically gifted women with a good head on their shoulders could attain the numbers Tanya has. Just my .02 and really it does not take away from Tanya's achievement. She is a class act and wonderful athlete in all respects. Great work and attitude Tanya! Sometimes I think just showing up is good- but now I see from Tanya that intensity is the key. Keep up the great work! I have to agree Cam Birtwell, which is why I'm trying to convince my girlfriend to participate in the 2010 qualifiers. She's a beauty AND a BEAST! I enjoyed every second of watching Tanya's INTENSITY during every WOD on Sunday of the Games. Best wishes for continued success. You and your husband are amazing role models to the students you teach! "On the other hand, most physically gifted women with a good head on their shoulders could attain the numbers Tanya has." A couple things you might want to know about Tanya's performance. Some information to contextualize her "numbers"
1. In the opening event (7k death march) at least 3 "gifted women with a good head on their shoulders" were carried off by medical personnel. And the 2008 CF Men Games Champion along with many many others had bouts with staying conscious. This was the 1st event! 2. 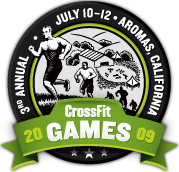 Tanya Wagner was the only athlete, female or male to finish top 5 in all 4 events in the 2008 CF Games. Another athlete named Chris Spealler finished top 5 in 3 events. Tanya lost the 2008 title by 10 seconds. 3. 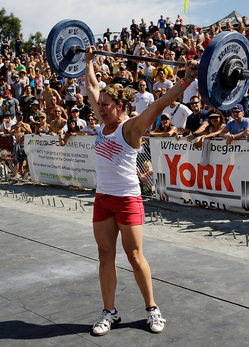 In 2009 Tanya wrecked shop and WON the CrossFit Games. Granted the Games have only been around for 3 years. But no other athlete has shown up LIKE she has. No other athlete has done what she has, not male or female. She has been number 2 and number 1, 2 consecutive years. 2 very different competitions. Pretty solid argument that Tanay Wagner is the best CFer alive today. So, I would not say "most physically gifted women " - BUT rather, only 1 woman can and has attained the numbers Tanya has. There are not even 2 woman. Just her, Tanya Wagner, all alone on the mountain top. Now seeing as she's from Souderton. . . if she's an Eagles fan. . .I REALLY love her. THANK YOU SEVAN. When I read that comment, I wanted to call BS but I didn't know how to go about it. Your comment pretty much sums it up. I already can't wait to see 75 physically gifted women battle it out for the top spots next year. It was amazing to watch Tanya battle through each WOD with single mindset and fierce determination. Congratulations Tanya. It was great meeting you.